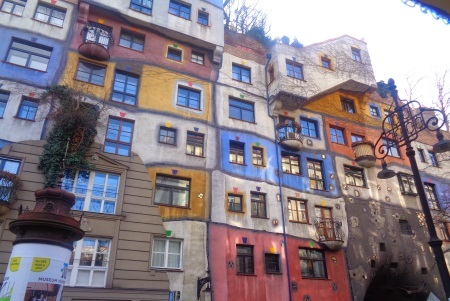 The Hundertwasserhaus is one of the most famous houses in the world. The building was built between 1983 and 1985. The striking building was a new beginning in architecture when it was completed. The house is without straight lines. The facades are varied and colourful. Plants grow on the roof, some of which are now large trees. All in all, in our opinion one of the most unusual houses in the world. We particularly like the connection between nature and architecture. The Hundertwasserhaus is a residential house of the city of Vienna with real apartments and can therefore only be visited from the outside. Thus, you do not have to pay the entrance fee. The building can always be viewed and photographed from the street. This can be done 24 hours a day. So there are no special opening hours. Only in the approximately 5 restaurants and shops in the Hundertwasser house you can enter. The pizzeria on the right side is quite good. You can find it by going up the stairs to the right in front of the house. The tram line 1 goes to the area. Best stop is „Hetzstraße“, distance about 50 meters from Hundertwasserhaus. You can take the subway to Schwedenplatz and change there to tram line 1 (journey time about 6 minutes). The hype around the Hundertwasserhaus is incredibly big. Every day thousands of tourists come to photograph the building. Opposite there is a shopping center for tourists, the so called „Hunderwasser Village“. There you find several souvenir shops in different sizes. Almost everything that tourists buy in Vienna is offered. There are also several fast food restaurants for the many Hundertwasserhaus visitors. In the shopping centre Hundertwasser Village there is a WC (80 Cent) in the basement. There is an information office in the Hundertwasser-House. Only a few meters away from the innovative building is the Fälschermuseum Wien. The interesting museum deals with forgeries of well-known works of art.